Our blankets are loved by kids of any age, perfect for armchairs, movie nights, sleepovers and even the family pet! They are easy to wash and quick to dry, easy to pack and ridiculously cosy. 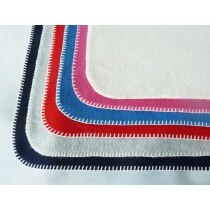 Every blanket is hand made in England for superior quality and workmanship. They're edged with blanket stitching and are now available in 3 sizes and a range of colours. Personalise yours with bold letters, made from the same gorgeous soft fleece.